This nut-sponge roulade is suitable for Passover because it's gluten-free. We adapted this recipe from one called Pecan and Hazelnut Roll by Marialisa Calta from The New York Times. We substituted simple syrup for the Grand Marnier and we iced ours with cream cheese frosting. But since confectioners' sugar in the frosting is not considered kosher for Passover, we've included instructions on how to make your own. 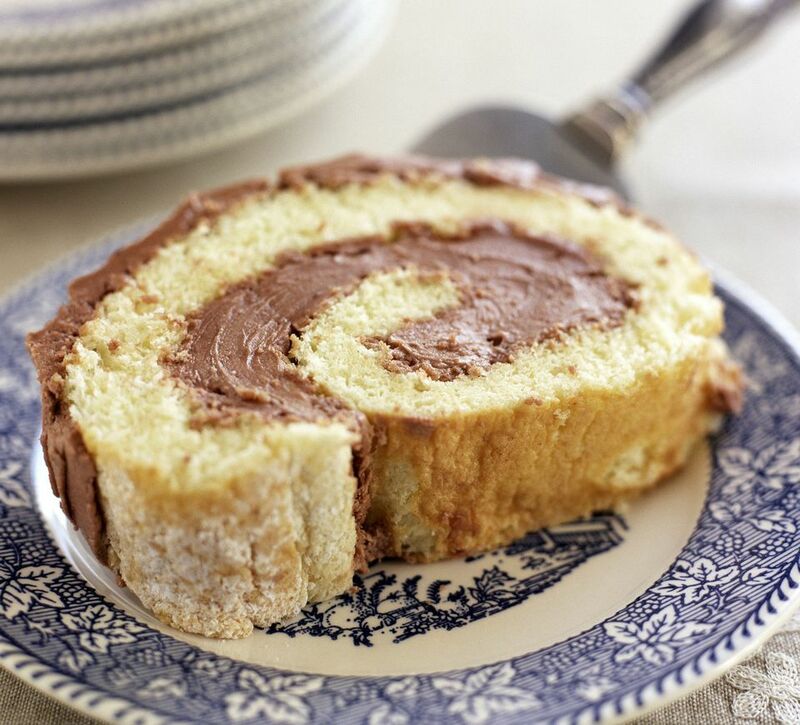 Here are more Passover recipes and more dessert roulade recipes. The recipe calls for hazelnuts and pecans to be ground, but if you can find hazelnut meal and pecan meal (finely ground nuts), it makes things a lot easier. A roulade is a French word for something that is rolled and can refer to a sweet dessert made with sponge cake and filled with whipped cream, pastry cream, ganache and sometimes fruit. These dessert roulades are also commonly called Swiss rolls. The cake is said to have originated in Central Europe, not Switzerland, so the name's origins are unclear. A savory roulade, on the other hand, refers to a thin piece of meat, poultry or fish that is spread with a filling and then rolled up, tied and cooked. To make the sponge: Heat oven to 350 F. Coat a 15 1/2 x 10 1/2-inch jellyroll pan with cooking spray. Place a piece of parchment paper on top and lightly coat with another film of cooking spray. In a large bowl, beat the egg yolks with the brown sugar until thick and light caramel color. Fold in nut meals, baking powder, and salt. Add the vanilla. Whip the egg whites until stiff and fold them into the sponge batter. Spoon into the prepared pan. Bake for 15 to 20 minutes or until edges are turning light brown and a toothpick tests clean in the middle of the cake. Do not overbake. While cake is baking, spread a clean, lint-free tea towel on a counter and dust it with confectioners' sugar. When cake is finished baking, remove it from the oven and immediately flip it over onto the prepared towel. Remove the pan and carefully peel off the parchment paper. Roll the sponge cake and the towel together from the long side. Let cool completely. To make the filling: In a medium bowl, whip together the cream until thick. Add the sifted cocoa, superfine sugar and simple syrup and continue to beat until stiff peaks form. To assemble the roulade: Unroll the cooled cake and remove the towel. Use a spatula to spread the cream evenly over the cake. Then carefully roll the cake back up again. Refrigerate until ready to frost. To make the frosting: In a medium bowl, beat the cream cheese until it is perfectly smooth. In a separate medium bowl, whip the butter at low speed, then gradually increase the speed and beat until the butter is light in color, perfectly smooth and makes a slapping sound as it hits the sides of the bowl. Add the confectioners' sugar and mix at low speed until fully incorporated. Add the vanilla and beat at low speed 15 seconds. Increase the speed to high and whip until perfectly smooth, creamy and light, about 5 minutes. Add the whipped cream cheese and beat at low speed for 30 seconds to combine, then increase the speed to medium and beat for 30 seconds to lighten the frosting. Use right away or store in an airtight container for up to a week refrigerated. To decorate the roulade: Ice the entire roulade with the cream cheese frosting. Decorate with shaved chocolate, if desired. Refrigerate any leftovers. To make your own Passover confectioners' sugar: For every cup of confectioners' sugar needed, pulverize 1 cup minus 1 1/2 teaspoons granulated white sugar with 1 1/2 teaspoons potato starch in a food processor to a fine powder.